SNAP! 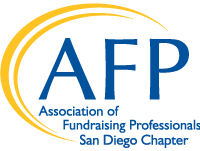 is a program for senior-level members of AFP San Diego (members with their CFRE or with a minimum of 10 years experience in development) who are committed to advancing the profession of development and have demonstrated a strong, positive commitment to the philanthropic community and the development profession. This is a wonderful opportunity for senior-level members to network and participate in educational programming targeted specifically to their needs. For more information, please contact Mary Rose McDermott: SNAP! Chair, at mmcdermott@sandiego.edu. Increase your professionalism and advance your career by becoming a Certified Fundraising Executive (CFRE). Perhaps you've been thinking about it for awhile, but need that extra little push to start the CFRE process. The Certified Fund Raising Executive (CFRE) designation provides you with a way to demonstrate your achievements, integrity, and mastery of philanthropic fundraising to your employer, colleagues, donors and the community at large. TBD for 2019. Check back soon for updates!